The new Battle.net icon/logo without text. Battle.net is Blizzard's online match-making component and social networking tool for their game franchises. The network features both PvP and co-op for multiplayer gameplay. The network offers its services to about 12 million players, and with a new version of Battle.net that will be available with StarCraft II, Blizzard naturally hopes they can serve even more fans. At this point in time, Blizzard has only released information about the StarCraft II-specific features for Battle.net, most of this article reflects that. As soon as Diablo III information (or any other game) is revealed or leaked, it will be added here. It's important to point out that older games will not automatically be compatible with all/any Battle.net features. This is primarily a network for StarCraft II and newer games. However, it seems likely some functionality will be used for StarCraft I since Rob Pardo has called services like iCCup a "pirate service", that Blizzard will combat. 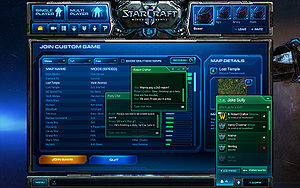 Loading a game of StarCraft II. The player will see a use for being connected at all times, even when playing single player, as he connects to a "character" online that gains achievements, limited avatars or decals and other related features. There are a number of features that will only work online. Also, there will be an offline mode for Single Player, Skirmishes, the odd plane flight, or any internet downtime players may have. Unfortunately, this pillar also includes the main reason why there is no multiplayer functionality for LAN. For RTS games on Battle.net, like Starcraft II, the new Battle.net use a competitive arena matchmaking system that is more intelligent than most available matchmaking technologies right now. This system "learns" progressively which players to match up. The idea is that whatever skill level you are, you should have fun online, and be set up to win and lose about 50/50. Diablo III players will instead be matched with people they are likely to have fun with, playing in co-op games. Chat interface of Battle.net. Somewhat reminiscent of Facebook. Logging in will allow access to better friend management and other social gaming components. It's easy to use, and easy to keep in touch with friends that play any Blizzard game. There will be both text chat and voice chat for players in StarCraft II/ and World of WarCraft (presumably all Blizzard games in the future) to use in any game to talk to each other. It will work like a backbone to the network, and will seamlessly integrate friends lists, matchmaking, messaging, and other features, as well as connecting to social media such as Facebook. Players that wish to remain anonymous on Battle.net have the option to do so. Blizzard has implemented a Friends List into Diablo III. It allows cross-game friends and chat, making it easy to communicate with friends who are on Battle.net, even if they are playing Starcraft 2 or World of Warcraft. The Friends List sorts by account, using the new Battle Tag for easier semi-anonymous connections than would be possible by typing in account names or using the much-reviled Real ID system. See the Friends List article for full details and screenshots of this new Battle.net feature. The Battle Tag was introduced in December 2011. It adds a player-selected name to each player's account, allowing players to use this single name as their Battle.net handle for all of their Blizzard games. It functions largely as the Real ID system was going to, minus the real name privacy issues that so many fans objected strongly to. See the Battle Tag article for full details. Mod support is basically "map making" support, since the maps can easily be modified to be anything rather than just an RTS game. The support for it will include an easy way to view and use mods, as well as being able to charge people real money to use your mods, if you have managed to create a very popular one. 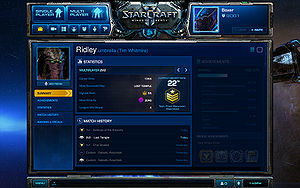 Battle.net profile screen showing the character "Ridley". Battle.net is now outfitted with a brand new feature going live with StarCraft II, and it's a StarCraft II Battle.net character. This character serves as your single persistent identity across the service. Everything you do in the game -- win/loss record, achievements, unlockable rewards, friends list, and more -- will be saved to your character profile for you and your friends to see. Even your save game progress in the campaign can be synced to Battle.net. Say you upgrade your computer and re-install the game; once you connect to Battle.net, you can continue the campaign right where you left off. This can be handy for people using more than one PC, allowing progress wherever the player is. Cross-game text and voice chatting. In addition to the anonymous lists and social experience, there will also be a Real ID concept on Battle.net. It's a mutual friendship, so both parties must agree to the request. Players can then see their Real ID friends by their real name, along with any character they are logged in as. There is also more detailed presence information about what they are doing, you can send or receive broadcast messages to/from them and use cross-game communication between StarCraft II, Battle.net, and World of Warcraft. It's optional, and need not be activated unless the player wishes to. Blizzard sees only benefits in the Real ID system. Many players are much less sanguine about it. The Real ID article recounts what happened in July 2010 when Blizzard announced a real name requirement for posting on the B.net forums and fans reenacted the storming of the Bastille. Causing Blizzard to relent and change the proposed feature. Blizzard intended to phase chat channels out of B.net with their newer games, starting with Starcraft 2. They did not include chat channels in the design, and resisted adding them until continuous player requests wore them down. Chat channels were not supported during the beta or upon launch in July, but by October 2010 they were said to be well under development and due to be added in the future. There's no guarantee they'll be enabled for Diablo III, but if fans demand it they probably will. Bashiok: Regarding chat channels, they weren't a launch feature but are indeed coming, and the tech will be there and waiting for Diablo III, I'm sure. 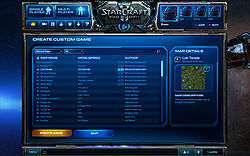 Since Battle.net in its new shape is designed for StarCraft II, most of what we know about it is based on this game. Some information is true for both Starcraft II and Diablo III and some is not. 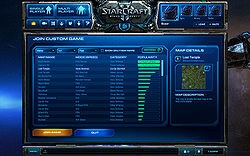 This is the more StarCraft II-exclusive features we have been shown. 1v1 Platinum League division 75 shown here. The new Battle.net matchmaking service will measure player skill more accurately than ever before, making online competitive play more accessible for a wider audience. 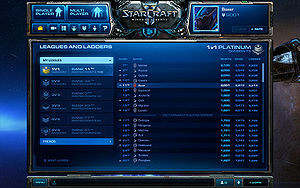 There is also a new Battle.net Leagues and Ladders System added to the service. After using the auto-matchmaking system a few times, Battle.net will automatically slot players into a league and division that best suits your skill level. The goal here is to encourage local competition by finding players a neighbourhood of 100 players of equal skill to be ranked against. The intention is to make ranked online play much more enjoyable and give everyone a realistic chance to win their division. Beyond ranked matches, Battle.net will also make it easier to compete by offering a number of other game modes. Custom games will of course make their return, but there will also be a slew of new, casual-friendly game modes such as the Practice League, Co-op Versus AI, Challenges, and more. Replays will now automatically be uploaded to Battle.net, and be available for anyone interested in watching them. Creating a custom game from available maps. Joining existing games, much like the old Battle.net, but with more visual feedback. The Blizzard community has previously been very creative and made a lot of maps and mods for the games seen on Battle.net, like DotA, Tower Defense, and many others. More on this in Mapmaking. To help this further, Battle.net will feature a Map Publishing feature that will let users upload their maps to the service and share them with the rest of the community immediately on the network. 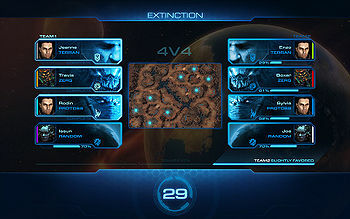 Players can publish, browse, and download maps directly via the Battle.net client. Players trying to find games based on specific mods (like DotA or Tower Defense) will have little trouble with the new custom game system, that will allow easier searches and filtering of custom maps. Sometime after the release of StarCraft II, modders will have access to an even more advanced means of sharing their work via Battle.net with the StarCraft II Marketplace. With the Marketplace, players will be able to browse, download, rate, comment on, and even buy mods if their creators choose to put a price tag on their work. Thus far the Diablo 3 team has given no specifics about how Diablo 3 will interface with Battle.net. They've mentioned numerous planned improvements, such as to trading and finding other players interested in the same sort of game experience as you, but with the game still so far off, and Battle.net undergoing extensive remodeling pre-Starcraft 2, no details have been offered. IGN: Considering that this is the big debut for the redesigned Battle.net, have you figured out anything you're planning on doing, with the exception of things like, obviously, easier ways of setting up co-op lobbies or creating panels so that everybody can immediately jump in and start up exactly where they left off? Jay Wilson:' Well, for us, Battle.net is... we're not quite at that stage. The full extent of our Battle.net development is that we do run through Battle.net. Pretty much everything that we reveal about Battle.net is going to be introduced in Diablo 3. I won't go through all of this because I don't want to take all your time, but the social networking aspects, the easy communication across games, and definitely... some of our big hooks are really good matchmaking, there was some poor matchmaking in Diablo 2, it was kind of esoteric and hard to use. We want a platform that puts you right next to someone else who's into the same thing as you, at the same level. We want you to be able to open up that friends list and say, oh, my friend Steve's killing Diablo, join! And you're right there next to them. We want players to be able to play together very, very easily. That's going to be a lot of work. Blizzard has not yet revealed any details of how Diablo III accounts and characters will be handled over Battle.net. The team has said that they want to cut down on muling and mule characters. They're allowing each character much more storage space, and all characters on an account will be able to exchange items easily, either through a shared stash or some other game mechanism. From this it seems likely that players will not have such a need for multiple accounts used just to store surplus items. Diablo 3 characters created over Battle.net should last forever, regardless of the status of your player account. They should remain even if you uninstall the game or stop playing for a year. The way we handle cheating is almost the same across all our games. Battle.net is the same group for all of us except WoW - but they have representation there as well. Can I give specific examples? Not really, because it's kind of technical and I'm not very technical. But the same group that work on Diablo 2 worked on WoW; worked on StarCraft; worked on StarCraft 2 - Security is their obsession. I would hazard to say we have the most security conscious and experienced staff in the world at solving this problem and that's what they will focus on. It's one of the reasons why the online group is a common support group for all us - we all benefit from the experience of all the previous games. Blizzard has always (so far, as of August, 2011) maintained that it will be possible for gamers to play StaCraft 2 and Diablo 3 for free over Battle.net. 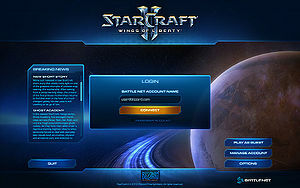 "When a player buys the StarCraft II box at retail, they will have the ability to play on the new Battle.net for free." An interview with Jay Wilson during the 2011 Gamescom convention provided some details on which features of the Diablo 3 Battle.net service will be free. "…we've intended form the very beginning that Diablo 3 be an online game, and an online service and that allows us to provide persistent friends lists, cross game chat, persistent characters that we never delete even if you uninstall Diablo 3, we'll store your characters for you so if you ever return. All that for a game you don't pay a subscription fee for is a pretty good value and we feel worth the price of being online." Wired.com: So you don't want to say if you're going to monetize through Battle.net or is that going to be discussed later? Paul Sams: What we’re saying is, if you buy a copy of StarCraft II, you will be in a position to play the game on Battle.net with no additional cost. That's not to say there are no other things there. But, you'll be able to play and have a great experience. But they'll be a lot of different elements; we're going to be pulling a lot of social networking into the Battle.net experience, and they'll be a much more significant focus on e-sports, and so the competitive elements of that gaming experience with ladders and rankings and tournaments and everything you could imagine and more. We're going to integrate the games that we have into that Battle.net experience so that it feels like a much bigger and more meaningful community made up of all these Blizzard gamers. When I think of StarCraft II, and if there are other things we're going to do from a monetization perspective, it's certainly possible. But again, if you buy the game, you can play on Battle.net with no additional cost. On top of the monthly subscription fee, World of Warcraft has added various additional revenue streams through allowing players to pay to move their characters between realms or switch their alliance. It's expected that we'll see similar options with Diablo 3; players may be able to pay to move characters between servers, pay for larger stash sizes or to create more characters on a given account. Another possibility is that Diablo 3 might offer something like the current Diablo 2 ladder character system, but only to paying subscribers. Currently, Diablo 2 realm characters who are created in each new ladder season have special perks non-ladder characters do not. There are numerous high level unique items, cube recipes, and end game quests that only ladder characters can access. This is free in Diablo 2, but in Diablo 3? Other potential bonus content for Diablo 3 subscribers who pay the (monthly?) fee might include ladder rankings of various types, the ability to create more characters per account, special subscriber-only quests, tournaments and PvP rankings, and more. Note that this is all speculative; the Diablo 3 developers have not yet made any official comments on what will or will not be offered for free over Battle.net. In terms of the financial model, our ideal, our goal has always been to make the game first. You know, what’s going to make the best game? And then we’ll figure out what we need to do to support that on a financial model side. Other quotes have been much the same; entirely non-committal about fees in either direction. It's clear that the developers are keeping their options open, but hoping to include some additional revenue streams -- if they intended for Diablo 3 to be just as free as Diablo 2, they've had plenty of opportunities to say so. "Mike mentioned it in an Activision Blizzard investor meeting [paraphrased] “A player that buys Starcraft 2 at retail will have the ability to play on Battle.net with no additional fee.” I’ll point out that this is a very carefully worded statement." We'll get a much better idea of their plans for Diablo 3 when Starcraft 2 is released and we see what sorts of fee vs. free services it offers, and how those go over with players. Unknown what these "forms of payment" might be. Image from Battle.net, not part of WoW, July 2009. Battle.net started as a matchmaking service for Diablo players in 1997, and was revolutionizing at the time, as it did not require the player to go out of the game to connect to the service or set up a game with a friend. It had IRC-like chat commands that could be used both inside and outside of the game, and was a very popular way to play Diablo. Diablo unfortunately suffered greatly from hacks and cheating, something Blizzard helped improve in the second iteration of Battle.net, for StarCraft I and Diablo II. With Diablo II, the Battle.net team was reinforced with more anti-hack measures, and by the release of WarCraft III, there was a whole team dedicated to keeping the network safe from cheaters. 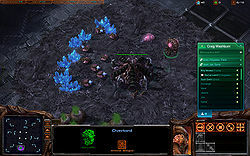 Battle.net fell out of favour with StarCraft players as the network became increasingly outdated and laggy. An unauthorized third party service called iCCup gained popularity. It's essentially a hacked, or at least modified, version of Battle.net, and offers more services and functionality than the original. "Battle.net 2.0" is a nickname given to the new version of Battle.net by the fans, and the work on it presumably began in late pre-alpha inside Blizzard in 2008. Back then, a great deal was still known about the network, and you can read more about it in the Battle.net 2.0 Article Series publicised by IncGamers' game channels at the time. Blizzard also stated that services like iCCup would be fought with legal measures when the new Battle.net is released. Interview with Battle.net project director, Greg Canessa. This page was last edited on 11 January 2012, at 16:07.